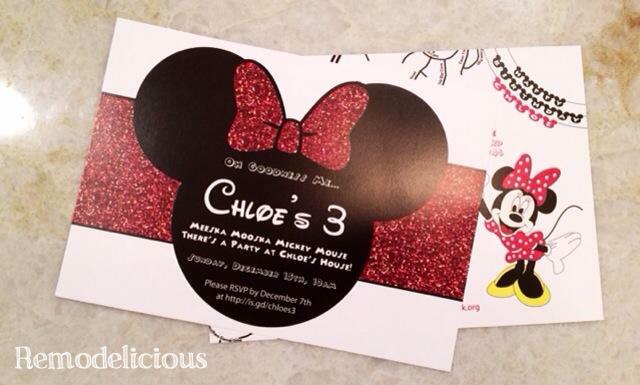 Chloe just had her 3rd birthday and I’m really happy with how her invites turned out. 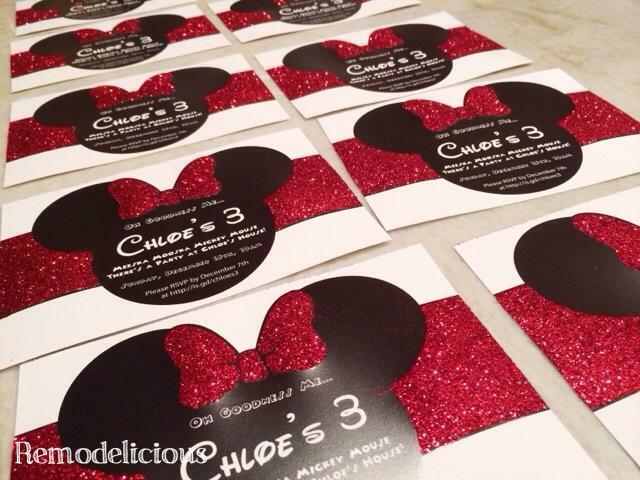 I was inspired by the evites this mom sent for her daughter’s party, but couldn’t find anyone selling paper versions so I made them myself in Photoshop. 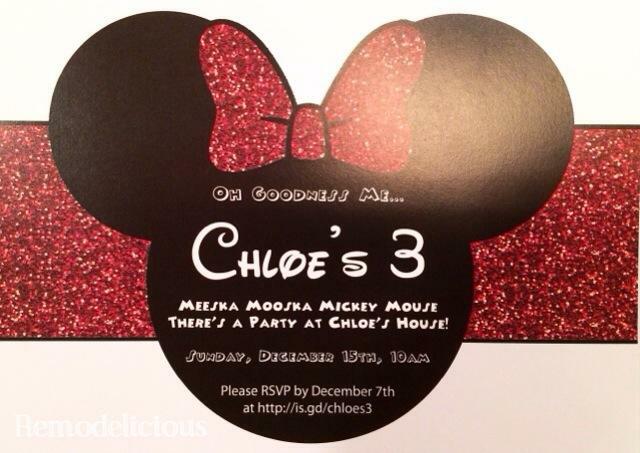 On the back, there’s a clip art image of Minnie Mouse, a “Happy Birthday Chloe” banner, and a map to our house from stamen.com (since we moved recently and only about half of the invitees had been to our new house). 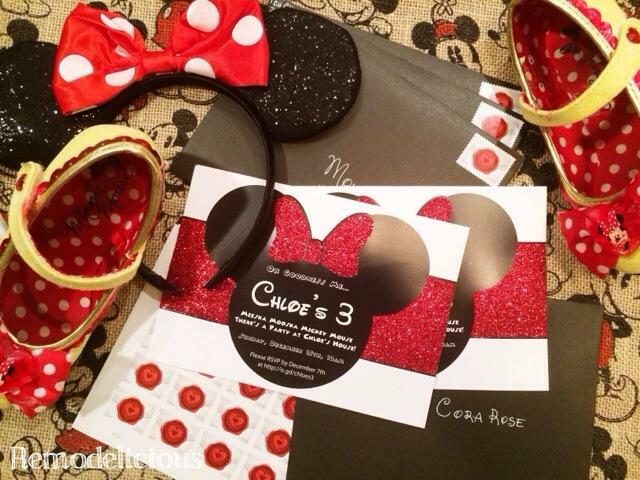 On the front, I used circles to create minnie mouse and found s clip art bow to use. 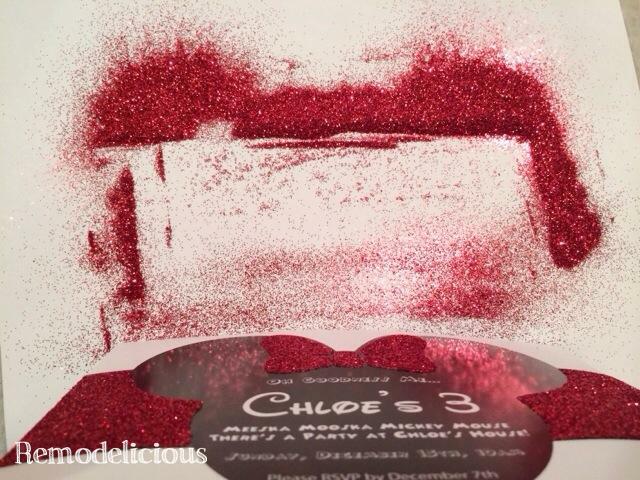 Then I copied a glitter image from an online craft store to create a glittery background. I had these printed at a local print shop so I could pick them up quickly, for a low cost, and in a small quantity. 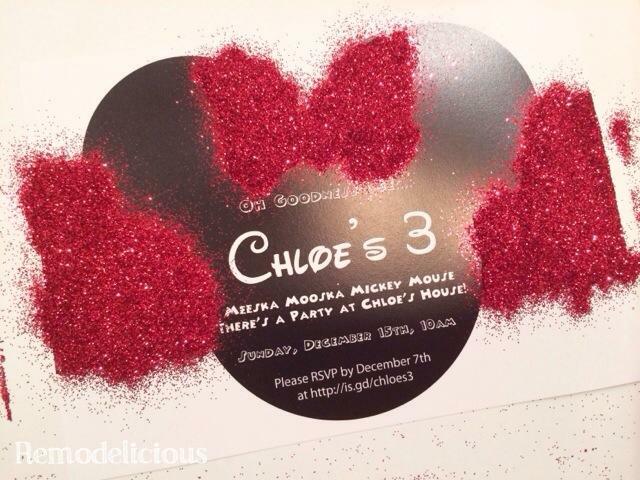 Even though I had the glitter printed, I wanted to go the extra mile with actual glitter. I had the glitter printed in case the glitter came off (or in case I completely ran out of time and need to send them without glitter). 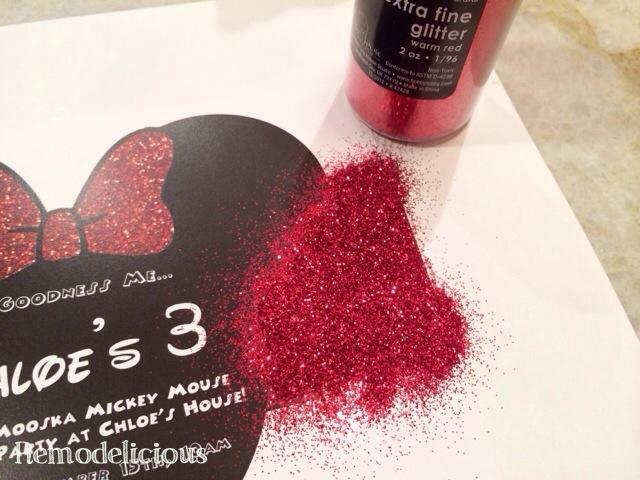 I used a paint brush to cover the glitter areas in glue. 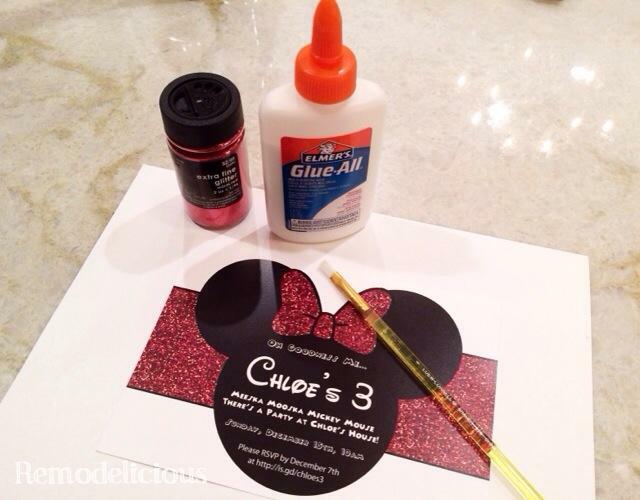 Working one section at a time so the glue wouldn’t dry too soon, I then covered each area in glitter. I did each side section and the bow separately, so 3 sections. 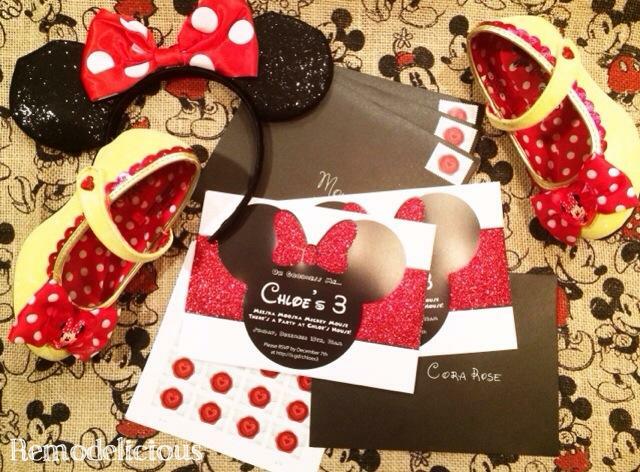 Then I dumped the glitter out onto a pice of 8.5″ x 11″ card stock that I used as a working surface and gently tapped each card to let the glitter fall off. 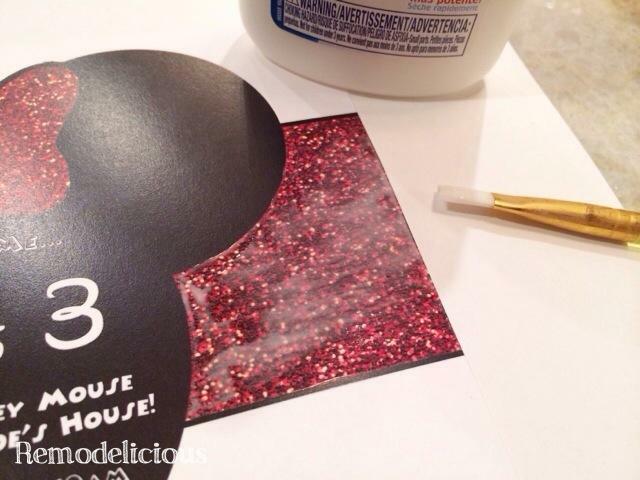 I dumped the glitter on the card stock off into a container to re-use. Then I lined them all up to dry. After they dried, I taped them again agains the sides of our kitchen sink (while dry) to get any excess glitter off in an easy to clean spot. 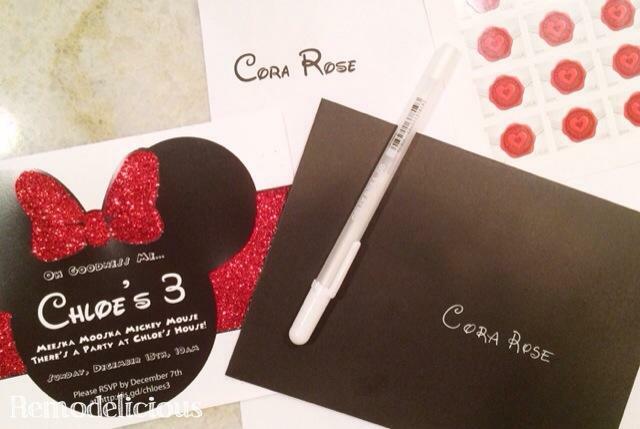 For the envelopes, I used black envelopes and a white gel pen. I printed out a list of addressees in the Waltograph font and copied them onto the black envelopes. I wrote the addresses in simple block lettering for legibility. And of course, I used the “sealed with love” white and red stamps from the post office. I love how these turned out! By the end, I got pretty good at writing in the Waltograph script and carried it on to other party items that I will post more on in a separate post (or two or three).